Now that nearly every store you used to frequent has online options, plenty of holiday shoppers are ditching the elbow-jabbing crowds and welcoming a stress-free shopping experience via the virtual world. But while web shopping offers convenience like we’ve never seen before, it can never duplicate some of the best facets of taking to the stores to stock up Santa’s sleigh. You’re missing the invading smells of gingerbread, peppermint, and pine boughs. You’re forgoing the dazzling light displays, and you’re selling yourself short if Jingle Bells and The Christmas Song don’t continually fill your ears! Understandably, you want to steer clear of madhouse department store as they fill with busy shoppers. But if you’re looking to go beyond the mundane and make your shopping time a little more worthwhile, South Carolina’s top shopping spots have just that. From unique markets, to cute shopping districts and grand outlets, be sure to check out these 15 excellent holiday shopping destinations this season! You might need to bundle up if balmy Charleston weather isn’t in the forecast. This open-air market dates to 1804 and offers plenty of unique, handcrafted gifts, like the highly coveted sweet grass baskets. Not to mention you’ll be doing Charleston artisans a favor by shopping local—look for the Certified Authentic Handmade in Charleston seal. It’s shopping with a view at North Myrtle Beach’s Barefoot Landing (although it’s recommended you wear shoes). More than 75 national brands and unique shops and restaurants line the boardwalks, and usually feature plenty of Christmas lights to boot. And if you need to take a break from all that shopping, set your sights on a live dinner theater or a river boat cruise along the Intracoastal Waterway. Oh, and watch out for the alligators lurking in the lakes under the boardwalks! Located right off bustling Woodruff Road, you might get frustrated fighting the traffic to get here but you’ll realize it’s well worth it as soon as you shift into park. With dozens of big name retailers (like Barnes and Noble, Total Wine, and Marshall’s), local stores and plenty of eateries to fuel your spending spree, you can satisfy everyone on your list in a single day of shopping without driving all over town. Can you say “selection?” Because you’ll find plenty of that at Gaffney Premium Outlets. Located right off I-85, you’ll find the biggest names in factory outlet stores with prices to fit any budget. Make sure you check their website before you go for extra savings at several of their stores. Who knows? You might even have enough cash left over to treat yourself to something nice. Bring your walking shoes—you’re going to need them! Coastal Grand Mall provides plenty of variety to make your Christmas shopping a one-day excursion. There’s food, shops, a movie theatre, and even a recreation area for the kids. Once you’ve strolled the massive indoor perimeter, don’t forget to check out their outside annex. It’s big city shopping with a small-town flair. The Market Commons is a unique development of shopping, eating, and living designed to mimic the pedestrian-friendly atmosphere of larger cities. There’s plenty of free parking on the streets and in the large parking garage, and since the area is somewhat small you’ll never have to walk more than a couple blocks to get around. Greenville’s historic Main Street has always been considered a spending paradise, but its multiple facelifts throughout the past decade or so has only upped the ante. A few high-end stores are scattered in between popular brands and unique specialty boutiques, with plenty of restaurants dotting the path when you need a break. The scenery alone will make your entire trip worth the walk. This charming little seaside shopping area has “beach life” written all over it. There are 22 unique shops offering clothing, shoes, jewelry, and handmade gifts, and other fineries. Tucked right off the main highway, it’s bound to be less crowded and less hurried than any mall or superstore. You’ll find some of the most popular retailers side by side to save you some gas money at Lexington Pavilion. Places like Target, Best Buy, and World Market line the parking lot’s perimeter to keep your tank from running on empty while you run all over town to find the perfect gifts. Sophistication? Check. Scenery? Check. Unique selection of shops? Check. When it comes to holiday shopping, The Shops at Belmond Charleston Place turns the season’s biggest stress into the season’s greatest experience. You’ll discover fun, eclectic stores, like the Art of Shaving, and familiar names, like Tommy Bahama and Godiva. In addition, they have an entire Christmas miniature village on display, complete with a train designed and built in South Carolina. Being so close to Charlotte, North Carolina, you’d expect to find plenty of quality shopping meccas filled with your favorite brands in Rock Hill, and the Rock Hill Galleria is just the place. And don’t forget to bring your kids—or your pets—to get a photo with Santa. Shopping, dining, street performers… it’s nothing short of unique. You’ll find some of the best stores a mall can offer, but without the mall. All the stores are close together, so park once and get ready to help Santa tackle his Nice list in one swoop. Where the Greenville Mall once stood only a decade ago has now been overtaken by an emergence of specialty shops, now known as Magnolia Park. Right alongside humming Woodruff Road, shoppers can fill their carts and their bellies with a varied offering of clothing, gourmet foods, jewelry, toys, and unique knickknacks everyone thinks are cool but would never buy for themselves. Thanks to revitalization efforts, downtown Sumter has become quite the small business shopping destination. You’ll find a fun clothier for boys and men, specialty gift stores, a vintage music store, women’s clothing shops, and plenty more to fulfill your family’s wish list. Christmas abounds in downtown Conway, complete with sparkling light displays and Christmas trees. 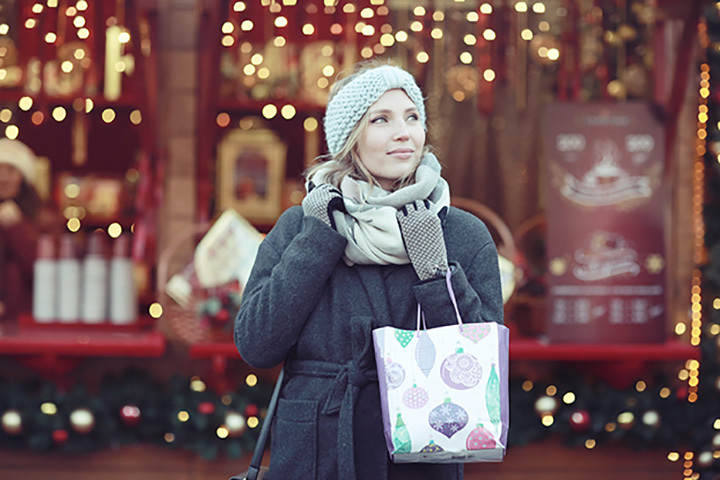 With the waterfront as a backdrop, you can stroll among the specialty stores in search of the perfect gift worthy of a place under your tree. Santa’s even been known to make an appearance or two, so make sure you put your best foot forward when battling the holiday shopping army.